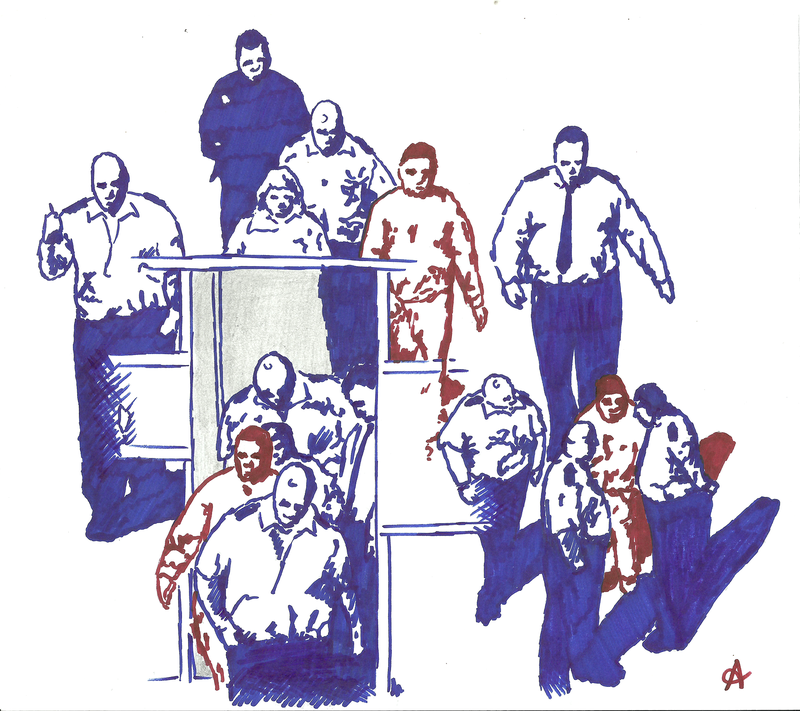 I did this sketch from three CCTV images which were recently given to me, showing another prisoner being led from the scene of a fight to the segregation unit. The full film shows four officers and a specialised dog handler escorting the prisoner from the scene of the fight to the unit where he would spend the next few months before being transferred to another prison. What is most concerning is the behaviour of the officers as they stand waiting for the gate to the unit to be opened electronically. The female officer backs off and the dog handler disappears from sight but the three remaining officers surround the prisoner. The biggest of the three officers stands side on to the prisoner with his right arm pulled back, the second officer circles round behind him, and the final officer holds his hands behind his back and leans right in to the prisoner’s face. I can’t possibly say what the officers intentions were in this case, but their behaviour is remarkably similar to tactics I have seen used by other officers in the past (both against myself and others). It tends to be the case that one officer will lean in and taunt you, saying whatever it takes to try and get a reaction, whilst holding their arms behind their back so that you cannot use their aggression as a defence if you do react. Meanwhile, the second officer will circle behind you, ready to grab and hold you if you so much as raise your hands above your waist, and the biggest officer will stand ready to strike you (in defence of his colleagues of course) at the first sign of a reaction. As I said, I can’t say that this is what the officers on this particular CCTV film had in mind, because I couldn’t possibly know, and I’m not allowed to say such things. But it certainly looks similar to me and I have no reason to disbelieve what the prisoner in question has since said to me about it all. I sort of wish I could just put the video, or even just some screenshots up here instead so that you can judge it for yourself. Unfortunately I can’t do that either since it would identify individual members of staff and prisoners and I am forbidden from doing that. Instead this sketch will just have to do. I am certain that this behaviour is quite common. It is outrageous and appalling. Using these tactics are Inhumane and should be criminal. Bullying and cohesive behaviour is not acceptable. I totally agree. In the case in question the officers took exception to the fact that a prisoner had (falsely) alleged that he was attacked by multiple other prisoners. It always amazes me that some officers think it is wrong for someone to be ganged up on, though they do exactly the same thing themselves! I actually like it when they try to cover things up. The thing is, they’re really not very good at it, and their attempts to conceal what they’ve done just makes the case against them even stronger. It’s an accurate drawing then!